Your Daily Dose of Sabino Canyon: Here's looking at you! 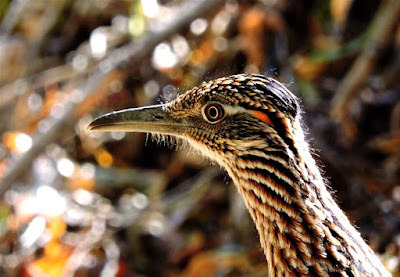 On the second Ned-less Nature Walk of the season, I asked Fred Heath for an explanation of the great increase in Greater Roadrunner sightings over the last month or so. He revealed that we are seeing a lot of juveniles, as 2015 seems to have been a great year for survival of roadrunner chicks. How cool is that?